ARS Kenya, an established Nairobi-based auto rental and leasing services company, offers long-term rentals and multi-year leasing services for premium clients including NGOs, embassies, and multi-nationals. Our primary lease offerings include full sized 4WDs, SUVs, and double-cab trucks from Toyota. Toyota's premium full-sized four wheel drive (4WD) LandCruiser models are available for leasing from ARS-Kenya. All highly capable in the city and even more so outside of the city boundaries where roads are not as reliable, these are ideal vehicles where rural travel is expected. Also, with seating capacity for up to 7 passengers, as well as luggage, leasing a LandCruiser makes sense for 4+ passengers, especially where ground clearance and getting there comfortably and safely is a must! 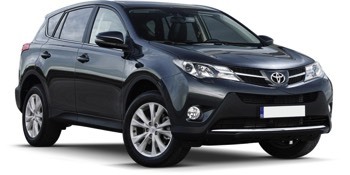 ARS-Kenya is proud to offer Toyota's Rav-4 SUV vehicles. Rav-4 are great in the city and areas where moderate ground clearance and ability to handle non-paved roads is a occasional requirement. They are able to seat 4 passengers comfortably, plus a sizeable volume of luggage space in comfort on almost any terrain, great for weekends up-country. Need a pickup truck that is capable of carrying gear as well as people? 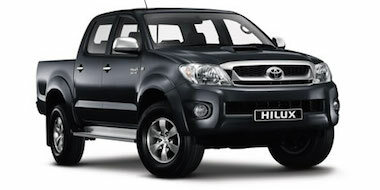 We offer both single-cab and double-cab vehicles, including Toyota's Hi-lux models for multi-year leasing services. With the capability to carry people as well as a bed-full of gear, these vehicles are great flexible options for fieldwork-oriented transportation needs. Let ARS Kenya help you resolve your organization's needs - speak with us today! ARS Kenya leased vehicles come with three thousand kilometers of mileage each month already factored into our rates, and we can discuss alternatives if you believe your fleet needs will exceed this. Our leased vehicles include full comprehensive insurance, so there are no hidden charges. In the event of a damage claim, the you are only liable for the excess premium, which is negotiable at the time of leasing. You won't need to worry about regularly scheduled maintenance and servicing like oil changes, tire rotation, tune ups, etc. This is all a part of ARS Kenya's services to you as a leasing client. Another reason ARS Kenya fleet leasing makes sense! ARS Kenya is one of Kenya's longest-running auto rental and leasing services for premium clients. We know what you expect, and have years of experience delivering solutions at international standards. Speak with us today! If you're not familiar with Nairobi's roads and destinations, ARS can provide a GPS unit loaded with local East Africa maps and waypoints! Easy as 1-2-3! Need preparation for frequent off-road use, travel, safaris and the like? Let us know and we can arrange extras for your comfort and convenience during your lease. Maps, jerry (fuel) cans, GPS, roof racks, spares, etc are possible! ARS Kenya can provide long-term driver services. Our drivers are familiar with major urban areas, and can assist you during your leasing term. Let us know what we can help with. The first three years of ownership carry with it economic costs that making leasing an attractive arrangement. Depreciation, standard maintenance costs, and tied-up economic resources means the first three years of ownership are not economically attractive. Leasing is a favorable arrangement. Without up-front capital and existing and proven banking relationships, purchasing multiple vehicles can be a significant financial strain on an organization. Leasing provides a viable alternative! Leasing is often preferred for multiple reasons regarding paperwork, time to vehicle availability, and scalability. Need More Vehicles? Call Us! Our executive management has extensive experience working with local large and growing organizations, including embassies, multi-national corporations, NGOs, and individuals. We welcome the opportunity to help you get your organization moving! Contact us via email to sales@ars-kenya.com or via telephone to +254-733-927437 or +254-722-203062 so that we can speak further with you.